DNN Summit 2017 Denver is going to have some great giveaways thanks to the generosity of some really creative DNN Community Members. Ryan Moore of Moore Creative Company and the Southern Fried DNN User Group continue to support DNN Community based conferences in multiple ways. This year, along with volunteering on the DNN Summit Committee and assisting at the event, Ryan’s team has done some creative things for attendees. Every year conference organizers like to understand where attendees geographically come from. Often times during either the morning or afternoon announcements organizers will get those who have traveled great distances to raise their hand or stand up. This helps the community to understand how global of an audience we have plus it provides recognition for those who endure long travel plans just to attend the conference. As you can imagine it didn’t take long for organizers to start giving out awards for those who have traveled the longest distance. This year Moore Creative Co is helping us take the awards up a notch with the “Longest Distance” award. "In recent community events, at the end of the day, we celebrate those that have traveled the longest distance, or simply have traveled the longest time to arrive at the DNN event. Watching the Olympics this summer, it clicked that I wanted to create a gold medal award for the longest distance traveler that attended our next DNN event." After working with a copy of the DNN Summit logo, and some creative artwork adjustments, the rest of the work was down to 3-D modeling and test runs on a 3-D printer. The final product turned out nicely as you can see! We are not sure who may win this award, but from registrations it seems that we’ll have a nice competition on hand for it. Look for the long-distance traveler award to be given at the end of the day at Friday's closing ceremony. Good luck everyone and safe travels this week! The team at Moore Creative Company wasn’t going to stop with just the travel award though, they had other things in mind. Recent trends in technology have made IOT devices, microcontrollers, and prototyping physical objects with circuitry much more easily achievable. Ryan and his team have been leveraging their skills and this wave of technology as well. A few months ago, the Southern Fried DNN User Group saw the first light saber prototypes at one of their meetings. Yes, the prototypes were awesome. Since then Ryan and team have continued perfecting their light saber skills. 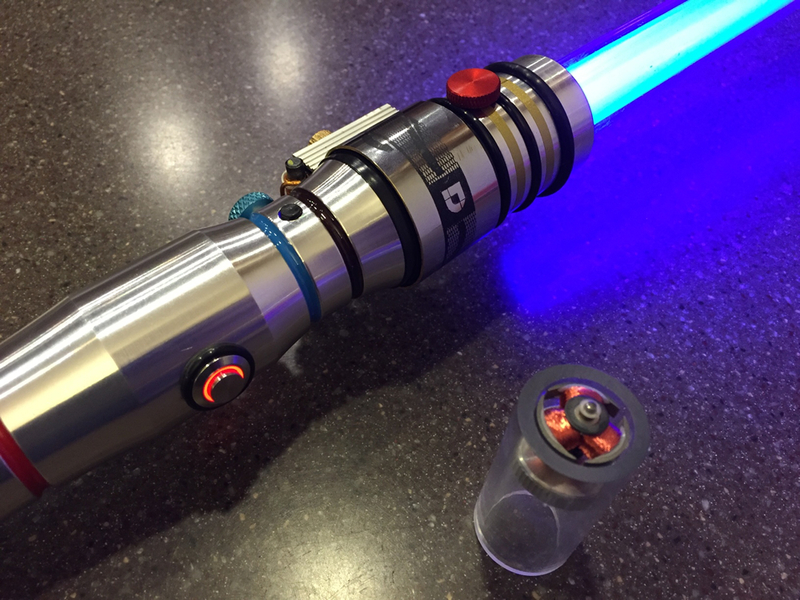 Even more awesome is the fact that Ryan and team have built a DNN themed light saber and are giving it away at DNN Summit! Talk about an awesome contribution to the community! 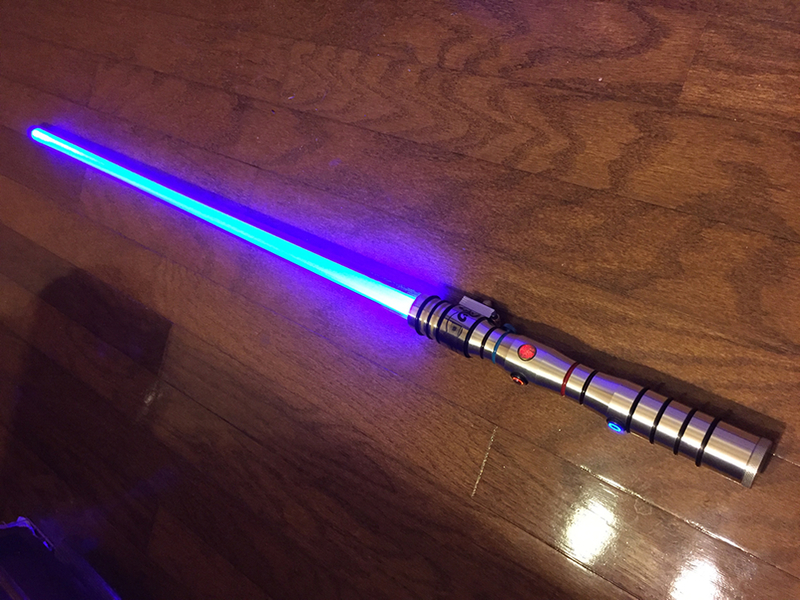 The light saber runs on batteries, has external lights that shimmer, internal lights that change colors, buttons to control it, various sounds aligning with the movements and actions being taken by the user, and DNN logos of past and present etched into the hilt! You will best understand it by watching the below “explainer” video from Ryan. Find out even more info & see other videos of the light saber on the Southern Fried DNN User Group website blog page. Many of you are reading and wondering how you can win this hand-crafted piece of artwork. The light saber is going to be given away by general raffle. At registration those who are interested will be given a ticket. If you’re wondering how you would travel back home with this, understand that the saber breaks down into 2 parts so it should fit in your luggage. It’s open to anyone who would love to win this unique piece of Jedi / DNN artwork. Thanks again to Ryan Moore and the Southern Fried DNN user group for continuing to make DNN Summit an awesome event! The prizes, swag, and awesomeness doesn’t stop there. We’ll also being giving out other “swag” and prizes at DNN Summit, but we can’t tell you all our secrets in this post! Are you a fan of JetBrains? If so, you’ll have a few chances to win licenses to their products! What about ASPOSE? We’ll also be giving away a few licenses to their products as well. Are you a fan of gorilla costumes? LOL! Aren’t we all? What about Yetis? Gorilla costume giveaways may or may not be on the schedule, but maybe you can get your picture taken with a gorilla or snag some DNN Summit Yeti stickers at some point. As you can see it’s going to be a great conference with some great giveaways. We look forward to seeing everyone this week!